Lots of ice, 2-3 large buckets/trash cans, a few dozen marbles, 2-3 towels. Fill each bucket up with ice & water. Place a bunch of marbles in the bottom of each bucket. Have kids compete to see who can get the most marbles out of the bucket using only his or her toes in a set amount of time. Alternatively, place 10 marbles in each bucket and see who can get all 10 out first. 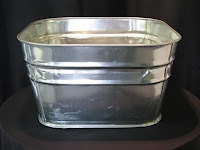 If you have access to a larger tub such as the one pictured, have 2-3 kids compete against each other in the same tub!